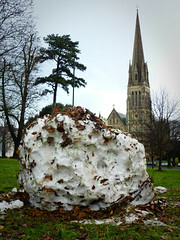 The snow has mostly melted away — the only bits I saw were the huge lumps that have been rolled to the sides of Clifton Down here and there, as pictured, transitory snow‐boulders that stand as a monument to what once was. Running really is a great way of exploring new music. I’ve just started to get into Kenickie, about twelve years after they split up, which is often the way with me. Left to my own attention‐deficit‐disorder devices at home, I’ve mostly been playing two tracks, Acetone and Punka, from their first album, At The Club , over and over again. Anyway. Yes. Running, this blog’s meant to be about running isn’t it? So, today I figured I’d take advantage of the sunshine and jog up to Clifton Village and around the Downs. I wanted to do more than a perfunctory 5K, but I figured 10K would be a bit much for the first run in two whole weeks. So, I nipped up Bridge Valley Road, keeping it nice and slow so I’d have some energy, then just went all the way around Clifton Down and back into Clifton Village (details here on RunKeeper.) As luck would have it, this got me to my usual finish point at exactly 7.00 kilometers, which was a pleasingly round number and just the right length. Break in the Clouds Get Running!